I’ve been the mother of a child with special needs for nearly fourteen-and-a-half-years. Which kind of makes me an expert. Recently, I was reminded of what happens when I don’t take the time to step back and better anticipate what can be done to make Ben’s life easier. For that experience to have meaning, I cannot simply sweep it aside with “well no one can anticipate everything” or “it was really the school’s responsibility to (fill-in-the-blank).” Jewish Tradition teaches that we must get in-between the black spaces and the white spaces in order to wrestle with the text and emerge with a better, and deeper, understanding. So too do we approach life. Chanukah, while deeply loved by my kids, also present some challenges for Ben. Late nights. The anticipation of the gifts. The disappointment of opening a gift that wasn’t what he wanted. Frustration over the dreidel game. The smell of the latkes. And the list goes on. I can’t change most of what makes this week hard for Ben. Yes, I can try to make Chanukah happen early enough for Ben, whose circadian rhythm shuts down around 6:00pm during Standard Time. I can frontload him in order to minimize his disappointment and, God-willing, avoid any resulting melt-downs. But those are coping mechanisms and strategies. The smell of the latkes frying in the oil literally makes Ben sick to his stomach. Insisting that our Chanukah celebration will be incomplete without latkes, as I have done every year, does not validate his very real sensations. In fact, it probably reinforces his feelings of inadequacy. Until I realized, thanks to Dr. Naumburg, that Ben needs something different from me. Lilly and Jacob have their right to having a positive Chanukah experience, replete with gifts, dreidels, and latkes. Shifting my approach will allow me to create better, and more positive, Jewish memories for all of my children. So yes, we are still having latkes this year. But oven-baked. And made on the waffle-griddle. The miracle of the oil will be retold and memorialized in other ways. Bonus: Some really terrific strategies for families with kids who experience the world differently. 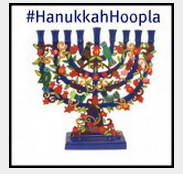 I’m participating in a #HanukkahHoopla with 7 other Jewish bloggers. In the spirit of the season, we’re giving 8 gifts to 8 lucky commenters. I’m giving away a copy of Carla Naumburg’s Parenting in the Present Moment and a copy of my CD, Soul’s Delight. You can comment on my blog or any of the #HanukkahHoopla blogs all the way until the end of the 2014. Click on the menorah to be magically transported to the schedule where you’ll find links to visit other fabulous writers and increase your chances of winning holiday cyber-swag! What is one thing you can do to stay “attuned” to your kids? Winners will be selected randomly. The giveaway will end on December 31st, 2014. Disclosure: I was not compensated to participate in this campaign. I have provided this FABULOUS prize to celebrate #HanukkahHoopla. When my son was young, he didn’t sleep on the bucket. He needed to be fully horizontal in a dark room to take naps. Once I figured this out and made the adjustment, my life got a lot easier. Meanwhile, my FIL used to tease me that my departures were always marked by a hysterically crying infant. He quipped, “Perhaps one day, you’ll be able to leave without drama.” His comment cut me to the core. I felt criticized for doing what I know my child needed. I mention this story because I cn relate to your concept of attunement. It’s difficult to have to adjust well-loved family & cultural traditions to make one person comfortable, but accomodating the special needs of others is truly an act of love. And you, sweet mamma, are loving and flexible and kind. Thank you for sharing your story, Rebecca. What a beautiful post and parenting moment. I’m a little embarrassed that I’ve seen your name around the interwebs for a while now and had NO IDEA that you were also a musician. I was listening to the snippets of tracks from your CD and my daughter (she’s two-and-a-half) overheard and said, “Mommy I like that song!” Your voice is lovely. Oh, but to answer the prompt, something I can do to say attuned to my kids: For my oldest, I can remember to prep him for things that I know he doesn’t like but can’t be avoided (like carpool). For the younger ones, it’s more a matter of being present (and not being on the computer, cough cough). I actually had a dance party with my daughter in the middle of writing this comment, so thanks! I recently discovered that a 1000 piece puzzle makes me very attuned to my family this year. My daughter and I are having wonderful conversations while spending time putting together this challenging jigsaw puzzle of Central Park on the dining room table. I hope she is enjoying this as much as I am. Dearest Rebecca: Thank you so much for sharing your journey. I love reading your writings. While pertaining to me (kids are grown and out of the house) I learn so much from you in each and every posting. I love the word “attunement.” Thanks for reminding me about that word! Still working at getting in tune. A lifetime process. I think for me it’s about listening really well to what our kids (and husbands and friends etc) are telling us. When we really listen to their words, we know what to do (usually) or we can then figure out what to do. My husband does not like (euphemism for “hates”) when I am on my cell phone texting too much…hmmm. So I need to leave it at home when we go out. My grandson told me the other day he doesn’t need so many presents…so I will stop (I thought I was being the “good” grandma by buying presents). Maybe he needs me to play a board game with him or read with him…and the list goes on! I love that you are making baked latkas because of your son’s sensitivity. Great idea! Thank you for sharing this story, Rebecca. I’m so touched by your sharing this perspective and advice from Carla. We have a child who sees and senses the world differently, and I’m finding nowadays that I’m attuning and re-attuning and readjusting as we continue to watch and help him grow. Happy Hannukah to your family! What a terrific piece. It’s hard to be attuned. Hard enough to know what my husband and I want, let alone what the kids want. Gifts at Hanukkah and moods present a particular problem. Especially when you have twins (like mine) who are the same age and gender, but nothing alike. Which boy will like your choice? How can I accommodate both? If I am accommodating both or at least understanding both, will one always get his way while the other needs to wait till next time? Or maybe I can come up with a mutually agreeable solution to problems, requests and planning. Maybe. Thanks for your excellent post. Before I can “attune” to my kids he biggest adjustment for me to let go of is a single definition of success. Sometimes success doesn’t look like what it looks like in the neighbors’ houses, and it doesn’t look like I imagine it to look (clean, on-time, etc.). But if I try to match “success” with “meeting my kids’ needs,” we all do a lot better. And I’m still marveling at the waffle iron latkes. Wow, this was a really amazing, thought-provoking piece. I struggle as a single parent (really, an only parent) to not get so frustrated so easily with my daughter. While some people may be able to say, “Go ask your father,” I don’t have that luxury and am constantly bombarded with every thought, question, etc. from my daughter. Every action she makes, I am responsible for it, whether it’s good or bad. I am the only one raising this ball of shining light. Something I need to learn to do is to judge what is the most important thing that I need to comment on, and to do it while I’m calm! I react a lot and I think bring a lot of anxiety to the home, and if I can tone down my own anxiety, I think I can make the home a bit less anxious, also. Thanks for making me think and hopefully, be”H, making my home happier because of it! I love that solution and Warren is a smart man. I’m so excited to have won your giveaway! Please let me know how to get in contact with you to receive the prize. 🙂 Hope you had a great Chanukah!